Link Posted: Fri Jan 17, 2014 5:53 am Post subject: It is finally finished!! This past week has been a week of celebration. The brewery that I have been working on for the last four months is finally completed. Thank you to everyone at The Electric Brewery for all your help during this process. For the most part, the book and instructions could not have been any better. I can understand the amount of work and time that went into writing such a detailed instructional book for all of us to enjoy. So again thank you for putting in the leg work. I had high expectations for this brewery, not only because Kal and others had promised it, but because I built most of it myself. I'm writing this today to say, I was NOT disappointed. This brewing system performed just like promised and more. I was so amazed at the ease of use, and the professional feeling I had while brewing. 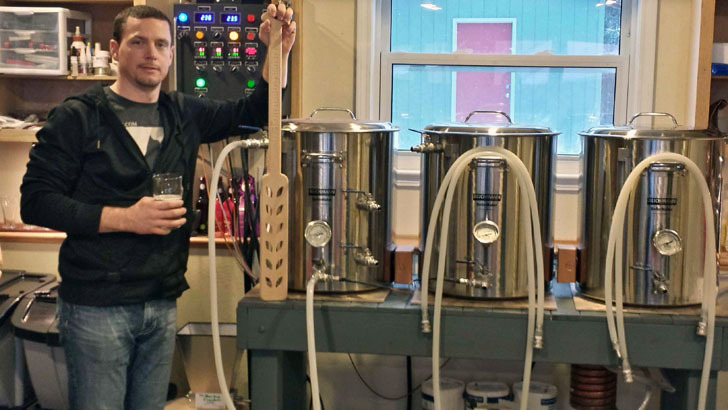 The first beer I brewed with this system was a beer recipe that I hadn't even brewed before. I was commisioned to brew some beer for a brother-in-laws wedding, and one of the request was for a lager. This system did not disappoint. I used Beer Tools Pro to formulate a recipe at 85% efficiency, and the final number said I achieved 97%. Now I know that is high even for the professional breweries, so I will brew another 5-6 batches to see what my actual efficiency is. 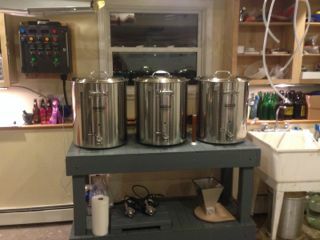 I can't express enough how happy I am with this brew setup, and I am told we are the first one in Alaska! Hopefully one day this setup will be the test batch brewery for my full scale brewery. Congratulations mate! It's a great feeling when you finally finish. I finished mine a couple of weeks ago and the first brew will be in the next few days. And it's awesome that you have the first one in Alaska. Nice looking brew area you have as well. If you ever do get the full scale brewery up and running please let me know and I'll add a link to that as well to help get the word out. Thanks Doubleplugga. Good luck with your first brew day. One word of advice, make sure the heating elements are plugged into the correct outlet. Mine were switched. Almost a tragic end to a great day. Kal thanks again for all your help, and I will let you know when Flying Crown Brewery grows up. Congrats on your new build, it looks great! For ventilation I am using a 42" stainless Broan 500 CFM range hood. I thought about doing the full hood like Kal, but ceiling room was a factor. I've brewed four times and the hood works great.